S/V ¨Zula " Spencer 31'- Year 1967 - Sloop - Build by Spencer Boats in Vancouver A fine example of this well respected great sailing vessel designed by John Brandylmyr. Available in Rio Dulce Asking US$ 15,000 Note from the Owner: S/V Zula has been a great pocket cruiser since her purchase in 2008. She's now docked at Punta Bonito in the Rio Dulce, Guatemala. I would still be onboard as I have been for the last nine fall and winter seasons but unfortunately my health forces her sale. She started out as a "project" boat but is mostly updated over these nine years. In her early life (1967) she had circumnavigated the globe and has had a baby born on board. Zula is a custom made sloop from the Canadian ship builder Spencer. She is hull number three. Although she's somewhat of an antique, she was built in the beginning of the Fiberglas era which means her construction was of much thicker fiberglass than found on most boats built since. She has called the fresh water of the Rio Dulce her home except for two years in Roatan and had a three month adventure in Belize in 2015. 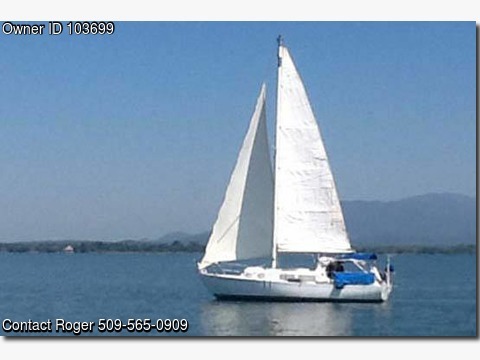 Although a proven blue water 31' pocket cruiser, she does well in light winds and is easy to sail. With all of her updates, including a rebuilt Yanmar 15 hsp engine and electric windlass, my hope is that whoever buys her will continue to update her as most of the big stuff is done. To your advantage, she comes ready to move onto and ready to sail. I am including everything on her, as I intended to be on her again this season but now that's not going to happen The foundation for Spencer Boats was laid in Saskatoon, Saskatchewan where John Brandlmayr grew up, went to University, and developed his interest and skills in the design and building of things such as boats and aircraft. In the early 1960's the product line changed to fiberglass hulled custom and semi-custom sailboats. Over the years, dozens of different models were produced in sizes ranging from 28 to 53 feet. The company developed a reputation for high quality and offshore capable yachts, particularly with the 35, 44 and 53 foot models. The following is an excerpt from tapes and notes left by John and which outline the philosophy which he brought to his designs and to their fruition: "For me the principal interest of boats has always been design. As a youngster building model airplanes, I worked out designs that could be built from the materials readily at hand. I found a particular satisfaction in applying scientific principles and art to the design and construction of a sailplane and enjoyed the considerable amount of general study it required. Building some iceboats and a sailboat at that time seemed like an extremely simple proposition. An enterprise that has given me a great deal of satisfaction and invaluable understanding of boatbuilding is Spencer Boats Ltd. which, together with Phil Hantke, a very good friend, was started in 1952 to build eighteen- foot plywood cruisers and runabouts. In 1997 the company was reorganized under new ownership and the company name was changed to Spencer Yachts Ltd. Seven different models were available from 35 to 46 feet. Darcy and Malcolm Wilkinson, veteran offshore sailors, became owners of the firm sometime around 2008 Web site has shut down in 2013 Zula was previously registered in Canada, now US Coast Guard Documented.Full specs provided upon request.